After the retirement of 10-year-old police K9 Nomos on Sept. 16, Medford Township Police was left with a vacancy in the department. Enter, Rio, a 15-month-old German Shepherd who began training to be Medford Township Police’s newest K9 dog a few weeks ago. Rio has been partnered with patrolman Joseph Canuso, the handler for Nomos who donated Rio to the police department. He is now training with Rio in a intensive, 19-week program at Ft. Dix Canine Academy. The process with finding a police K9 begins before the dog is accepted into the academy. Canuso said dogs are put through a 30-minute test to see if they’d be capable of handling K9 duties. Once a dog is selected, they are sent to the canine academy for training — a long process where the dog learns everything from obedience and agility to technical skills such as tracking suspects and objects. Agility training consists of exercises such as going through hurdles. The dogs are taught to go over various types of fences and walls as well as multiple hurdles. They work their way up to more difficult tasks as they go. After completing an exercise, the dog is rewarded. “We want to get them strong and confident,” Canuso said. Being able to track is the most important skill a K9 learns. Canuso said the vast majority of jobs K9 dogs are called to perform are people searches. Rio is also taught to do auto and building searches. Some of the training exercises include going into dark rooms, others involve tracking items around barriers and with distractions in the way. Canuso said dogs are able to perform K9 tasks because of their temperament and nature. To begin serving with the police force, Rio has to fill certain criteria. Once Rio’s training is completed, a video will be shot of Rio completing all the required criteria. Canuso and Rio’s relationship goes beyond the workplace. Rio lives with the Canuso family. The family has five dogs in the house, including Rio and Nomos. Canuso adopted Nomos following his retirement. Canuso said each K9 is a bit different. He said Rio seems to be more sociable than Nomos was. 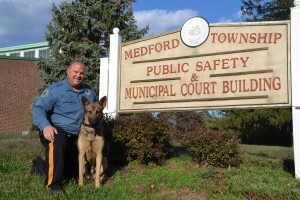 Not all police departments have a K9 program, but Medford has had one since the 1970s. Police Chief Richard Meder said the cost of starting the program can be prohibitive for some towns. He said the donation of Rio helped save the police department money. The police department is also able to use the same equipment and material Nomos used during his service. “It makes maintaining the program much easier,” Meder said. Canuso is hoping Rio can compete in the United States Police Canine Academy’s police dog trials some time in the future. The competition features many of the same tests the dogs go through in training. Nomos was twice ranked as the top K9 in New Jersey and one of the top-15 K9s in the country. For now, Rio’s focus is on completing his training. He will likely complete his training in the early part of 2015.